Recently, the main venue activities of “Sanyuesan Festival of Zhuang Nationality · Carnival in Guangxi” were held in Nanning of Guangxi. It is learned that the serial activities of “Sanyuesan Festival of Zhuang Nationality · Carnival in Guangxi” are not only a celebration for multi-ethnic unity and integration, but also a multi-cultural collision and communication. Tourists coming from far and near gathered together and burst out singing for the wonderful new life. It was learned that among the main venue activities held in Nanning City, the performance groups and international students from Thailand, Vietnam, Indonesia, Cambodia and other ASEAN countries brought us special performances. 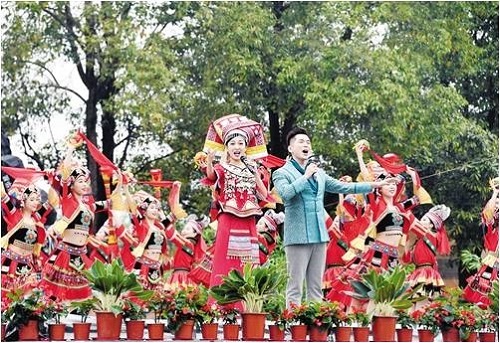 In addition, traditional folk custom programs, such as singing in antiphonal style at Zhuang nationality’s Folk Song Festival, Huapo (the goodness of sending and protecting children) giving her blessings, and the three-voice folk song of the Zhuang nationality in Mashan County, have been staged one after another, and the intangible cultural heritage has been fully displayed and inherited.